Amanda and Melissa are out picking apples today and then making homemade apple pies. I’m taking the easy lazy-man way out and bought a few apples at the store and made an apple crisp. I browned the peeled and sliced apples in a skillet with butter, added sugar, then a bit of Dekuyper Sour Apple Pucker (someone made Apple-tini’s at the last family gathering…) And cinnamon, allspice, and cloves. I thickened it all with a bit of cornstarch. 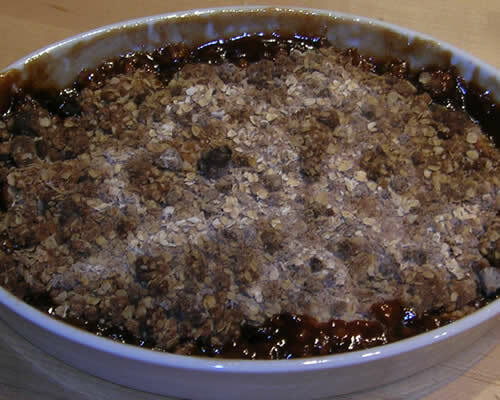 The topping is flour, oatmeal, brown sugar and butter, with more cinnamon, allspice, and cloves. Into a 425° oven for about 30 minutes. I love your new picture but you are much cuter than that. Victor, watch out!